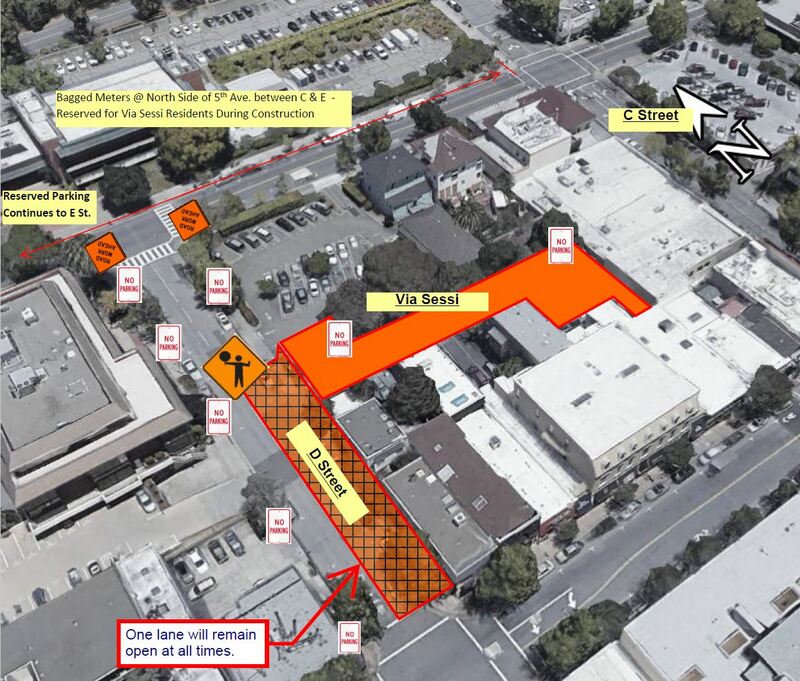 In preparation for on-site drainage work to be completed at the Public Safety Center, Public Works is managing a project to install a new storm drain system on D St (4th St to Via Sessi) as well as on Via Sessi. The project includes installation of six manholes and approximately 300 feet of storm drain pipe. While the nature of the work is straightforward, working in our downtown area can be a challenge, especially when it involves removal of on-street parking from businesses. In order to construct the improvements on Via Sessi, the street will need to be completely closed to traffic during the daytime hours. We anticipate the work taking approximately three weeks to complete. This enhanced storm drain system will receive connections coming from the new building currently under construction. The contract for this project was awarded to Ghilotti Brothers. Ghilotti is scheduled to start on June 25. Neighborhood outreach: In an effort to reduce potential impacts to the residents and businesses along Via Sessi (and on the storefront side on 4th), the City has created a comprehensive mitigation plan. As part of the mitigation plan, the Contractor distributed informational flyers and installed barricades with “No-Parking” signs in anticipation of the work. Additionally, City personnel discussed the upcoming work plan one-on-one with all residents and business owners. This personal approach was implemented to promote and maintain positive relations with our neighbors. The City carefully listened to the public’s questions and concerns. The main concern was lack of parking for the residents and customers that regularly park on Via Sessi. In response to the public’s parking concerns, Parking Services played an invaluable role by developing an alternate parking plan in collaboration with DPW and CM’s office. 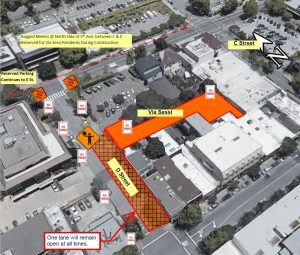 During construction of the Storm Drain Project, residents will be allowed to park on the north side of 5th Ave. between C St. and E St. Parking services will bag the meters before June 25, and residents will receive a temporary permit to park on 5th during working hours. Through these inter-departmental efforts, the City continues to ensure that its infrastructure meets the future needs of our vibrant city while minimizing the impacts to the community during these major improvement projects.